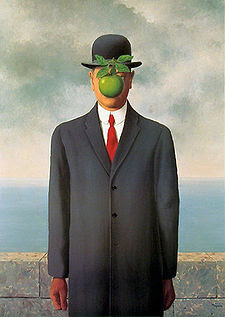 The Son of Man is a painting by surrealist painter Rene Magritte. It is an oil on canvas, composed in 1964. Magritte painted this painting as a self portrait of himself. Magritte said about this painting, "At least it hides the face partly. Well, so you have the apparent face, the apple, hiding the visible but hidden, the face of the person. It's something that happens constantly. Everything we see hides another thing, we always want to see what is hidden by what we see. There is an interest in that which is hidden and which the visible does not show us. This interest can take the form of a quite intense feeling, a sort of conflict, one might say, between the visible that is hidden and the visible that is present." I really like this painting, especially when looking at it after reading what Magritte had to say about it. I feel that he is right in the sense that people always have their view blocked by something going on, so that they don't see what they really want to see. Magritte did a few paintings similar to this such as "Man in the Bowler Hat" and "The Great War on Facades".